The referenced YouTube video, entitled the “Marshmallow Experiment”, presents Professor Phillip G. Zimbardo revisiting the “Marshmallow Temptation Study”, first led during the late 1960s/early 1970s by Stanford Psychology Professor Walter Mischel. Throughout the course of this study, Mischel attempted to identify how children oriented to time, or more specifically, whether a child was present oriented or future oriented. Additionally, Mischel sought to understand how a child’s orientation to time, whether present or future, affected their overall decision making process; with the premise that how a child orients to time, indicates how well the child will perform in school. Furthermore, Mischel argued, by recognizing how a child orients to time, one will then be able to predict the quality of the decisions the child is most likely to make once they enter adulthood. More than a decade later, when the study’s participants were interviewed at the age of eighteen, the differences between the present oriented children (e.g., those who were unable to delay gratification) and the future oriented children (e.g., those who were able to resist immediate temptation) were astounding! For example, the children who were categorized as future oriented, scored 250 points higher on their SATs than those children who were considered more present oriented. The future oriented children were also regarded for their cooperative nature, confidence, self-reliance, and ability to work well under pressure and with others. On the other hand, the personalities of the children who were thought to be more present oriented, were described as being moody, indecisive, prone to jealousy and envy, with the likelihood of overreacting when faced with frustration or adversity. 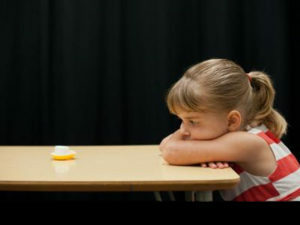 Therefore, given the findings of the “Marshmallow Temptation Study”, it can be concluded that a child’s ability to delay gratification can indeed predict the quality of the decisions they are most likely to make as an adult, and by association, their future outcomes. Finally, the “Marshmallow Experiment” YouTube video concludes with Professor P. G. Zimbardo discussing the results of the “Marshmallow Temptation Study” in relation to one’s personal happiness. According to Professor P. G. Zimbardo and his published work—The Time Paradox: The New Psychology of Time That Will Change Your Life, one’s personal relationship to time plays an important role in one’s personal happiness; for instance, to attain a keen understanding of one’s self (e.g., self-concept and self-awareness), in addition to an increased familiarity with social institutions (e.g., religion, politics, business, and national destinies), Zimbardo’s Time Paradox explains how to recognize one’s personal approach towards time, and how said approach impacts one’s daily decisions. Moreover, Zimbardo’s Time Paradox addresses the procedure necessary for an individual to distinguish how he or she personally orients to time; and, by the same token, this knowledge supports and encourages an individual in overpowering the hidden mental biases consuming and/or confining an individual to his or her past experiences. Subsequently, one’s harmful fixation with instant gratification is disrupted, and any apprehension surrounding one’s long-term goals is disbanded. This YouTube video concludes with Professor Zimbardo reiterating how his book, The Time Paradox, details how to improve one’s personal success, happiness, and psychological health/wellbeing, by essentially making one’s time work for their benefit(s). w Temptation Study” from Walter Mischel himself, as well as Craig and Carolyn Weisz (a brother and sister who participated as children during Mischel’s initial experiment in the latter part of the 1960s), Karen Sortino (mom to Craig and Carolyn Weisz), and fellow colleagues of Mischel’s, including Ozlem Ayduk, Marc Berman, Angela Lee Duckworth, John Jonides, David Levin, Yuichi Shoda, and Jennifer Winters. In other words, Lehrer’s (2009) Don’t! The Secret of Self-Control, is a third person point of view profile feature article, written in the past tense, about Walter Mischel. The article talks about Carolyn Weisz and her brother Craig who are now all grownup and in their forty’s. They had both undertaken this experiment when they were kids. Carolyn at that was a four year old and decided to wait so that she could receive a second portion while Craig on the other hand could not wait. When asked to take a similar test again they both claim that they would probably take similar decisions as they did when they were kids. Carolyn admits that throughout her life she has be able to become tolerant and therefore very patent while on the other hand Craig admits that he has been the exact opposite of her sister. The article highlights that they turned out to be totally different people in life. Carolyn grew to be a very patient person and did she very well in school to the point of attain a PHD at a very young age. She was also very jovial and kind as well as being very successful in life. On the other hand, Craig was the complete opposite of her sister and he suggests that he wish he could have been a little patient because his life would have turned out to be better than it did. Both the YouTube video and the article by John Lehrer on the New Yorker describe the marshmallow experiment. I find this experiment to be very interesting and I do agree with it on most part though there some areas I would have some disagreements. One area where I tend to agree with Walter Mitchell is that we can be able to determine the expected future behavior of an individual by studying his or her decision making process while at their childhood. For example in both cases that is the article and the YouTube, the psychologist were able to predict the future behaviors of the children under observation and it turned out to be true later on in life when they are grownups. The marshmallow experiment also suggest that we can be able to tell whether will have a happy and productive life by being able to maneuver the time paradox. It suggests that this would help us understand the world around us because the time paradox influences most of the decisions we make in life. I totally agree with this argument because in the case of Carolyn and Craig it turned out exactly the same as it had been predicted. Carolyn is future oriented while his brother is present oriented. Their lives spun out to be the opposite with Carolyn being able to achieve a lot in her life while Craig does not. These two individuals make me believe that Walter Mitchell argument is valid. However the only disagreement that I have with the marshmallow experiment is that while it has reported a high percentage of success, the situation would have been otherwise had these children been made aware of their conditions at a young age and therefore practice on improving their behavior. It probably turned out the way it did for Craig because he was not aware that he need to improve on his time paradox because it would affect his decision making process later in life. Had he been made aware of this experiment he would have practiced on improving his time paradox and today his situation would be different.